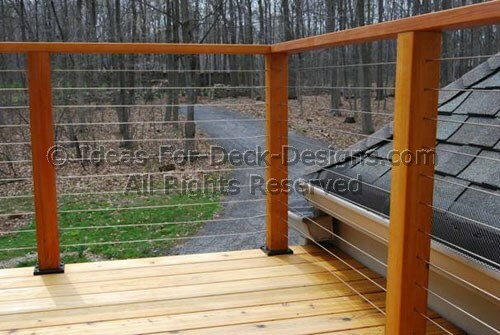 Deck cable railings are less common but may just be the perfect design call for your home. If you want an open and true feeling of freedom, cable or glass are your options. Any deck with a great view can benefit with this solution. But it is a unique style and it often doesn't look quite right on the average deck. 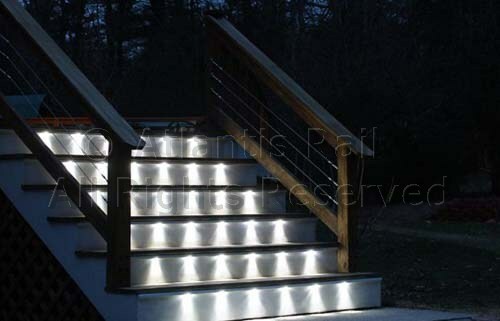 But a railing design like this is not for the average home. Check out this example. It just works beautifully. 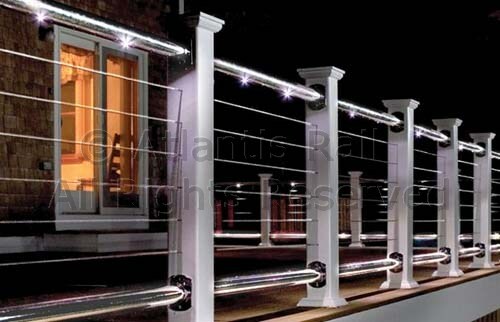 Here we have the Atlantis Rail systems on a very classic wood deck with large wood posts, base trim and caps. The horizontal stainless sections just modernize an otherwise traditional look. Some areas do not allow residential homes to have horizontal rail members than can facilitate climbing. So double check. But the possible applications, especially for waterfront properties, and certainly for commercial properties with views to exploit, are exciting. Notice the low voltage lighting touches under the top rail? The ablility to mix and match the horizontal top and bottom members with metal framing can also jazz up the exterior of your home. Consider this carefully because when done tastefully it's beautiful. Such as with this coastal location and Cape Cod style siding. But bold elements can also become too much of a focal point. The heavy 2x6 wood cap rail and 2x4 bottom rail and post make a robust looking frame. But the cables add a lighter feel, keeping the whole structure in balance. The nice thing with this kind of a system is its versatility in wood, composite or even stainless tubular frames as seen here. 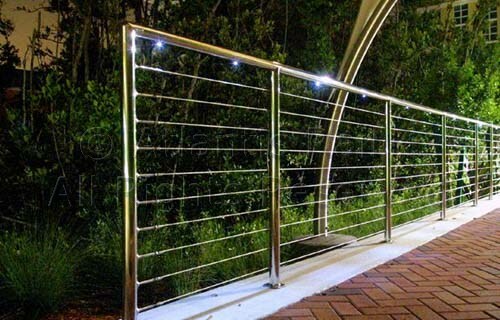 A metal railing frame like this is is certainly more expensive than a regular wood post and rail design. But some homes are better complimented or contrasted with metal. If your local building authority allows horizontal cable wire for decks, then check this out. This second storey porch balcony can take advantage of a great view. Posts should generally be set at 4' centers for maximum stabilty. Wind can easily pass through cables and so if this is a concern you may want to mitigate this with glass panels instead. 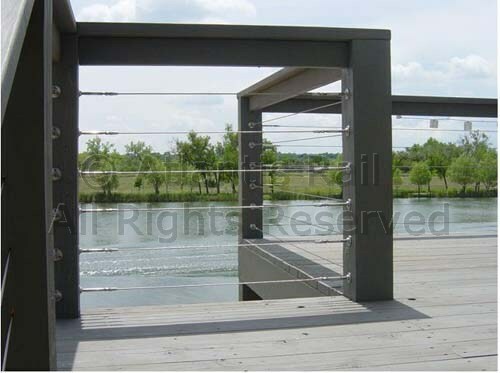 The critical elements in any cable railing system are the turnbuckles and the cable. A 316 stainless steel is what is going to look the best and look as good in 20 years as it does today. All the systems shown here are from Atlantis Rail. They make a Vanguard Cable Kit. There are other good systems like the one from Feeney. Or you can quite easily build your own. It's fairly simple. Here is what I recommend. 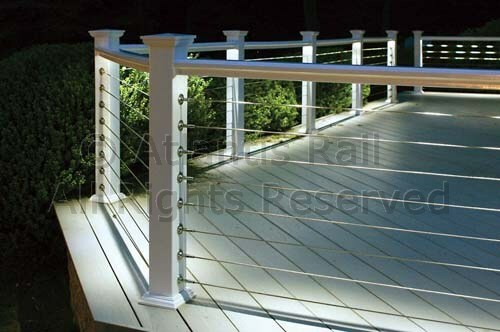 Are Cable Railings Right For Your Deck? Unobstructed views can be exploited very well with cable or glass. You've just seen many different cable railing designs that superbly show off the views from these homes. Just remember that not all jurisdictions will allow horizontal rail members and that cable systems do not reduce wind. Only glass rail panels can do that.